Major league baseball arrived in Seattle 50 years ago, when the Seattle Pilots joined the new American League West. The Pilots lasted one season in Seattle, plagued by ownership problems (lack of money), stadium problems (lack of seating) and plumbing problems (lack of water pressure). The Pilots moved to Wisconsin in 1970 and became the Milwaukee Brewers. The team arrived in Milwaukee only days before the 1970 season began, so they had to play in old Pilots uniforms sporting the Pilots’ blue-and-gold livery. To this day, the Brewers’ colors remain blue and gold, albeit a darker version. 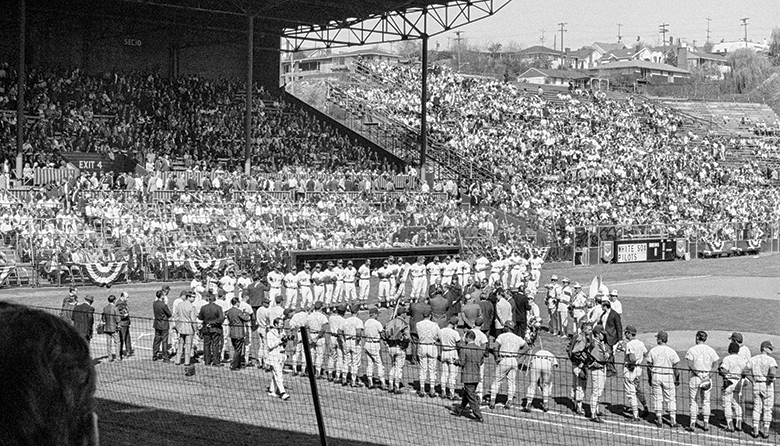 In this photograph, members of the Pilots and the White Sox stand along the baselines of Sick’s Stadium on April 11, 1969, the date of the Pilots’ home opener, which the Pilots won, 7-0. Sick’s Stadium, situated off Rainier Avenue on the western edge of Seattle’s Mount Baker neighborhood, was demolished in 1979. A Lowe’s store occupies the site today.